Sony Online Entertainment President John Smedley "can't wait to see" EverQuest Next on Sony's next-gen console. 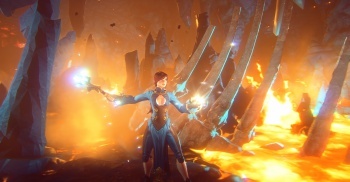 EverQuest is one of the longest-running MMORPGs in gaming history, and Sony Online Entertainment is planning to continue its flagship series with EverQuest Next, dubbed "the next generation of MMOs." Announced earlier this year, Next is due out in 2014 for the PC and Mac--and possibly the PlayStation 4, SOE President John Smedley teased in a recent interview. Speaking about the next EverQuest with GamerHubTV, Smedley said that he "can't wait to see it on the PS4." This isn't a confirmation, of course, as Smedley is quick to say. "We haven't announced, technically, that we're putting it on the PlayStation 4," he stated. "But it's fair to say that we're a Sony company, so I say that with a smile on my face." If EverQuest Next does come to the PlayStation 4, it will join DC Universe Online and eventually Planetside 2 in the console's MMO line-up. EverQuest was the first MMORPG I ever played, and as such it will always have a special place in my heart. I'll never forget waiting 20 minutes for a new area to load on a dial-up modem, or getting kicked off every time my brother picked up the phone, or spending hours in front of the family computer eschewing school, homework, and any semblance of a personal life in order to get my EverQuest fix. I'm fine now, really. I'm not at all concerned that EverQuest Next being on the PS4 would make it much more accessible to me. We'll let you know if and when EverQuest Next is confirmed for the PlayStation 4.